The Co-op Hall, the upper floor used for a number of purposes, including the Labour Exchange. It stood where Farm Foods is today. A cracking 1980s image by Brownhills George, and posted on Panoramio. That there Young David Evans has been a busy man. Not just with his comments, explorations of The Wood’s watercourses, or even his pursuit of squeezing great memories from David Oakley. No, David has thrown himself into researching George Fullelove, the great musical son of Brownhills, the Choral Society he was an exponent of, and the rich and surprising choral culture locally. I am so proud to host this work; for I know what’s coming up, and this is a fine body of research, with some truly shocking and surprising material – both written, sung and on film. To say we have a treat coming would be a vast understatement. Stay tuned. This is not just about choral music, but Brownhills Life from the 1930s onwards. In this piece, David lays the groundwork for the accessible history of the choral tradition in Brownhills, and I’m sure students of local history will recognise familiar names – Preece, Peake, Waine, Starbuck, Langford. To todays residents of the town, this is hard to visualise, but this activity was massive, and a very, very large part of Brownhills and Walsall Wood life. I thank David, not just for this, but for his tireless work and support. Without people like him, Peter Cutler, Andy Dennis Clive Roberts, [Howmuch?] and others, this blog would be frankly, bugger all. Thanks again. 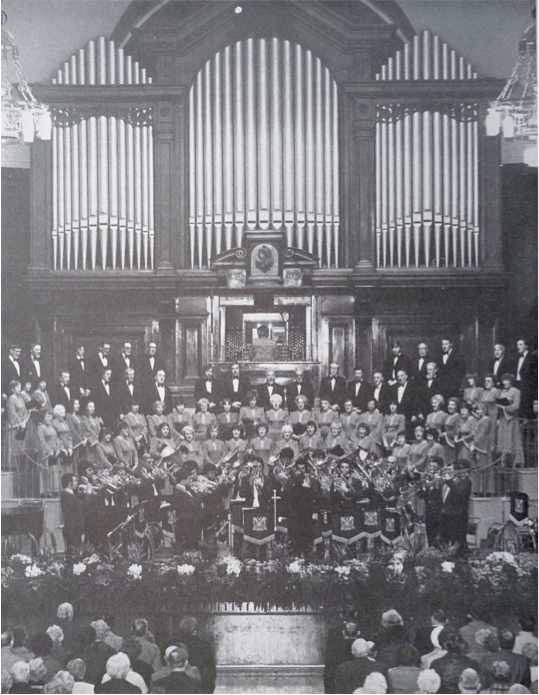 Brownhills Co-operative Choral Society at their Walsall Town Hall concert, 1979. Image supplied by David Evans. The renowned Choral Society of Brownhills was formed in 1949, when two choral groups amalgamated, so the minute-book states. But there are earlier references to ‘the Choral Society’ from as early as 1910. The first concert under the auspices of the Brownhills Choral Society took place last week in the Mount Zion Primitive Methodist Schoolroom (Brownhills). There was a capital attendance over which Mr F G Peake, who owned Walsall Wood Colliery, presided. A Lichfield mercury newspaper report from 1915 records a musical informal social evening held at the Mount Zion Methodist Church Sunday School where Mr. John Preece, choirmaster and organist, on behalf of the choir, presented Mr. George Fullelove with a writing desk and clock in recognition of his services a deputy organist. This is when Mr George Fullelove moved to the Wesley Methodist Church, some hundred yards away, along the High Street. These are the two plaques to the memory of Mr. Preece and Mr. Fullelove, in the present-day Methodist Church in Brownhills. From February 1917 a press report shows that George Fullelove took part in a ‘Sacred Concert’ in Brownhills Public Buildings, the proceeds going to the YMCA and the local Nursing Association. A Lichfield Mercury newspaper report from September 1921 records that the Watling Street Wesley Church, Brownhills, were holding their chapel anniversary and that during the afternoon members of the Mount Zion Methodist choir gave a musical service under the leadership of their organist and choirmaster, Mr John Preece, and that Mr. Jonah Deakin presided. 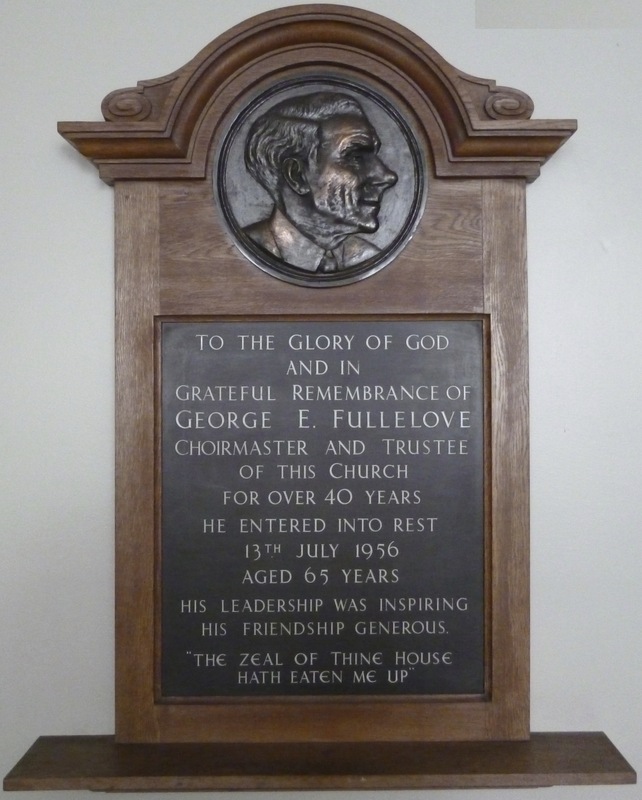 The Fullelove plaque in Brownhills Methodist Church. Image Courtesy of David Evans. David Fullelove, George’s brother, became secretary of the Brownhills War Memorial Hall in July 1926, and the hall booking records show ‘Choral Concert’ in October 1926, ‘choral society-discuss’ in May 1927; ‘Brownhills West Choral Society Concert’ on 29 September 1927; and ‘choral society concert’ December 8, 1927. The Lichfield mercury has records of Mr. George Fullelove being the choirmaster of Brownhills Wesley Choir, in 1932, and the same choir singing under his musical direction that year. In 1934 there is the first reference to ‘Brownhills Co-operative Male Voice Choir’ holding their annual meeting in the Co-op Hall in Brownhills, on Monday 28 August, (the year’s financial details imply that this group had not been newly created). Mr. W. Mansell was elected chairman, Mr. G. Willetts, treasurer; Mr. B. Plant (Watling Street) was elected as secretary. Messrs. A. Taylor and R. Astbury were treasurer and secretary of the choir sick fund. The choir decided to enter the choral competition at Winster. An enjoyable social was held in Brownhills Wesley Methodist Schoolroom… Arranged by Mr. J. Caulton, that Mr. G. Fullelove presided and that songs were rendered by Miss N. Wollaston and Mr. S. Langford, and there were pianoforte solos by Mr. S. Langford Junior, and Mr. D. Fullelove was MC for the games. A Lichfield Mercury article from March 1936 gives details of the Brownhills Co-op Male Voice Choir, giving a concert in the Assembly Room of the Rose Villa Working Men’s Club, Hednesford Road, Brownhills West, and that a Mr. A. Wright presided over that concert. 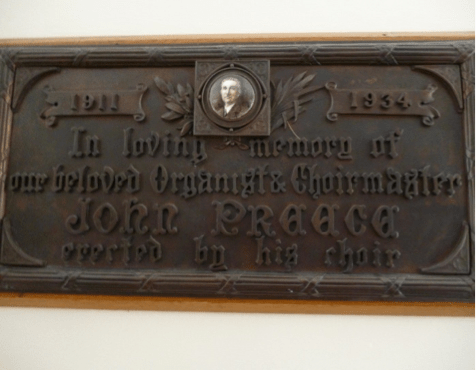 The Preece memorial, also in Brownhills Methodist Church. Image courtesy David Evans. A report from February 1904 show Mr. G. Fullelove was the choirmaster and Mr. S. Seedhouse was the organist at the Brownhills Wesley Church. In 1943 we see a newspaper report of a ‘Brownhills Choral Society’, under the conductorship of Mr. Abe Walker, giving a concert in the Pelsall Central Hall. The hall was filled and among the soloists was a Mr. L. Cliffe (bass chorister in Lichfield Cathedral choir) and Mr. Len Jones. Mr Abe Walker became the choirmaster in Ebenezer Primitive Methodist Church, Walsall Wood, a few years later. I understand the choir held their practices in the Congregational Church in Coppice lane, Brownhills. The Co-operative Male Voice choir minute book for 1946 shows there were 25 members, and that one of the bass singers was Mr. W. Delbridge from Walsall Wood. In 1948 this Male Voice choir entered the Chadsmoor singing contest. On January 19th 1949, the Brownhills Co-operative Male Voice Choir held a meeting with Brownhills Choral Society and it was agreed that the two choral societies would amalgamate and the Brownhills Co-operative Choral Society was born. This entry was posted in Brownhills stuff, Churches, Interesting photos, Local History, Local media, Local music, News, Panoramio photo discussions, Reader enquiries, Shared media, Shared memories, Social Media, Spotted whilst browsing the web, Walsall community, Walsall Wood stuff and tagged balladeer, Brownhills, Brownhills Choral Society, Brownhills local history, choir, Choral, co-op, Co-operative, David Evans, George Fullelove, Langford, Local History, Master, New Photos, Peake, Plaque, Preece, Road, Silver Street Methodist Church, Singer, Staffordshire, Starbuck, Things to do, Waine, Walsall Wood. Bookmark the permalink. I may have it wrong, but I think the church, Watling street Wesley church mentioned. which would have be know at that time 1921, was later known has Park View Methodist Church, what make’s me say this because the Deakin Family, all went to this chapel Johan Deakin ect . many thanks for the excellent presentation of this article, and to George for the photo of the building. In your post:”Walsall Wood; An old pictures special edition, August 17, 2011″, the photo of the choir shows Bill Delbridge, back row, second from the right, and Abe Walker , sitting on the front row, legs crossed and wearing his famous dress tie. Martin, Park View was the Wesley Church ! So many kind local people are helping me by sourcing and providing information, documents etc ..I am delighted..and will be thanking them properly in due course,when it is all done, that is!